Why Can’t We Have Microwaves and Racial Justice? I have a couple of very close Haitian friends who have recently returned to our community in Haiti after spending a significant amount of time in the US. Now that they’re back, of course, many of our other friends like to hear about their American experiences and often fantasize about visiting sometime themselves. As these conversations evolve under the mango trees and amidst the songs of chickens and crickets, it never takes long for the guys who have traveled to issue a warning along the lines of, “But being a black guy in the US isn’t always as sweet as it sounds” Then the others look to me for some sort of explanation. Although I can’t say what it’s really like to be a black man in the US, I find myself taking a deep breath and doing my best to explain the complicated mess of race relations that currently exist in our country. I try to explain to them the stories of Michael Brown, and Eric Garner, and Tamir Rice, and John Crawford III. I try to explain to them how those stories can exist in the same country as the stories of Barack Obama, and Oprah Winfrey, and Beyonce, and Wyclef Jean. I try to explain how Martin Luther King Jr. was an inspiration to millions but he was also shot for being so inspirational. And how some people think that inspiration isn’t supposed to come from certain colors I try to explain how in the US my Haitian friends there can indeed use the same water fountain as me and sit next to me on the bus, but the KKK still exists and functions freely. I try to explain to them that although, if they did come to my hometown, they would be welcomed in the community and greeted with kindness, they’ll also just as often be presumed to be thugs, and thieves, and gang members, and drug dealers. That if they decided to protest with me in the streets I might get some eyes rolled at me but they’d probably get spit on. I try to explain all of this and still justify how we can call ourselves the land of the free and the home of the brave. I try to explain to them that the only real way to be completely free and brave in our country is to be white, Caucasion, heterosexual, employed, not poor, and speak fluent English. Anything else and there will be plenty of people finding plenty of reasons to hate you. And then they’ll defend their hatred in the name of the Constitution and the God that they claim to believe in. We’ll hate you if you’re Mexican, Arab, Muslim, Voudouist, Queer, Trans, homeless, handicapped, depressed, or just a little weird. We won’t say that we hate you because of those things because that would just expose our ignorance. We’ll say we hate you because of other less obvious reasons but essentially they all boil down to hating you because you’re different. Because you don’t fit the status quo that we’ve imagined to define our country’s alleged greatness. Because our ingrained prejudices and our undeniable Privilege suggest that your differences weaken the curve. I try to explain this to my Haitian friends hoping, that me standing there among them, the only white in a varied spectrum of browns, makes me somehow immune to the injustices that we normalize in our US American society. I try to explain this hoping that they’ll recognized how ashamed I am to admit this reality of where I come from. My friends who’ve been there have seen the stories on the news and have been able to imagine their own image in the place of the victims. But then they come back to Haiti and all of their friends think that they’ve just returned from the Promised Land. How does one explain something like that? How do we reconcile what we’ve created with what we claim as our identity? I’ve struggled with these questions as many have for a while now. I wrote about my feelings after Ferguson and then thought that somehow, leaving the US and coming back to Haiti would give me a break from all of the upsetting news. But now I just have to go over it again and again as I try to explain it all to my friends. And it still never makes any more sense than it did the first 100 times. In the meantime, on the flip side, I am finding myself once again having to explain the riots in Jacmel to friends back in the States. 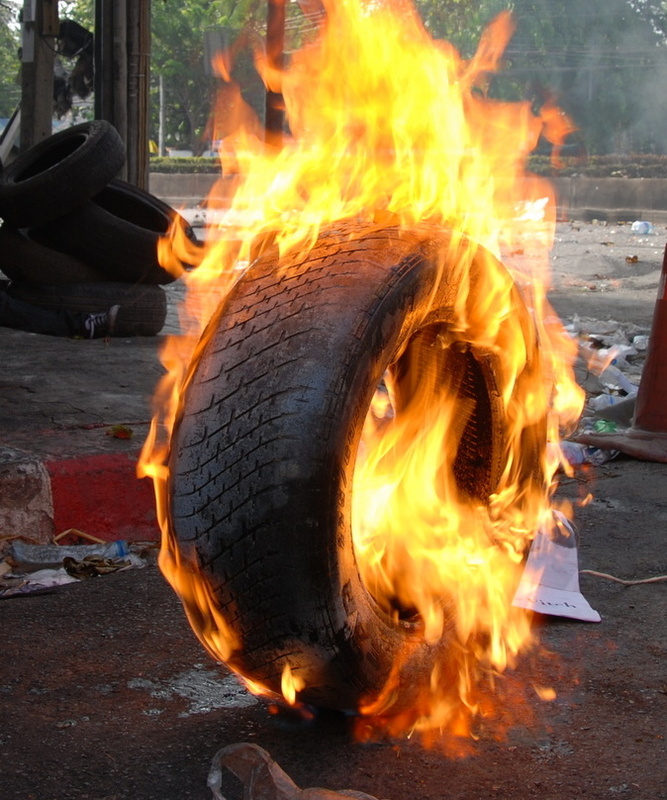 How an entire city can be brought to a standstill for a week by burning tires and piled rocks and angry people and how at the same time that does not make the place a violent place. How most of the people don’t even know what they’re rioting for and there could be a hundred different reasons. This fiery roadblock could be because someone accidentally shot someone else in the foot while the one 100 yards down the road could be because teachers haven’t been paid at a local school and the next one could be because someone’s wife cheated on him. And all of that means that I’m not making it to the beach this week but it’s probably better because I’ve got plenty of housework to do. And somehow, you just get used to it all because it’s happened before. I guess sometimes I wish the issues from the States were that simple. I wish that there were less complex reasons to our protests. I wish that we could say that people are organizing rallies just because someone’s donkey got stolen or a bridge is taking longer than expected to get built. I wish that talking about those issues resulted in nothing more than a temporary inconvenience to me rather than the more overwhelming realization that I come from a place that doesn’t value all human lives the same. But of course, life can’t be that simple because we’re humans. In my conversations with my Haitian friends the ones who have traveled usually resolve their explanations with something along the lines of “But at lease the microwaves and washing machines and the departments stores and the internet are nice.” It would just be nice if we could have the microwaves and the racial justice at the same time. I guess you can’t have all. Maybe some day. MLK had a dream that we’re still waiting on and I’m gonna go ahead and keep dreaming too. Thanks! Been thinking along these wavelengths. Never stop dreaming Lee. And you are creating a wonderful corner of the world with the work and impact you have as well as in sharing thoughts such as these. Indeed, we’ve still got a long way to go and this conversation is important to continue. Hugs from my heart to yours!